Beautiful 1983 53' Hatteras ED 3 stateroom in Amazing Condition. This boat is so detailed the owner even swapped every window for stainless steel frames. The interior is a rich wood, light carpet, stainless steel. Everything is labeled - so much attention to detail including the light switches are engraved and every switch is engraved to tell you its function. Professionally maintained. Even the engine room is show contest ready with stainless steel tops and exhaust tubes. As you walk through the back of the boat you pass the aft deck Varnished Teak Chairs through the Varnished teak aft doors to a large salon with light carpet and all light wood walls. With a large couch to starboard and a full bar forward, the salon is the comfortable hang out area everyone wants with a Sunday coffee and a good book. Every window also has day blinds that roll up and down swiftly with the pull of a string. Pilot houseThe pilot house has a generous amount of room with a aft white leather bench and control stations any captain would enjoy forward. With all new Garmin and Simrad electronics, this Hatteras is completely up to date. And if it couldn't get any easier, this boat comes with Bow and Stern thrusters to make docking this beautiful yacht as simple as waking up in the morning. FlybridgeThe flybridge is completely bimini top and isinglass enclosed with the option of rolling up a few isinglass panels. Just like the wheel house, the owner spared no expense and repeated all the same generous electronics on the flybridge. With aft seating, you could sit for hours and with one pull of the side door lever you can fully walk on the outside of the flybridge to the front or the aft where 2 modern day bicycles are stored for the those days you want a on road cruise of your destination. GalleyThe galley has all updated kitchen appliances Subzero freezers and fridge, 4 stove top burners, large 2 bowl sink, stainless microwave, dishwasher, and of course a trash compactor, and a cozy breakfast bench to starboard. The galley is larger than some 100' yachts. Froward stateroomThe forward stateroom has bunk beds to starboard and a single bed to port. VIP StateroomRoom located on port side midships is completed with a full size bed, bedside table, and large screen TV Master stateroomThis room boasts a large queen size bed with large forward closet, port side make up counter, large screen tv, and a large bathroom with shower and head. Engine RoomsEngines are port and starboard of midships hallway both in sound shield rooms large Detroit Diesel V8 -71's, water maker, Northern lights Gen, and cruise air conditioner, master volt battery charger. Forward deck has large walk around side decks with all varnished teak caprails, with forward dock boxes for your lines, and extra 50' 50amp electric cables. There is a large perfect condition sun pad in front of the chromed window frame front windows and a 5' bench below. The pulpit boasts a chromed windlass and varnished teak, with a bonus varnished flag pole. This is the nicest 53' Hatteras ED in the country and it shows the same. 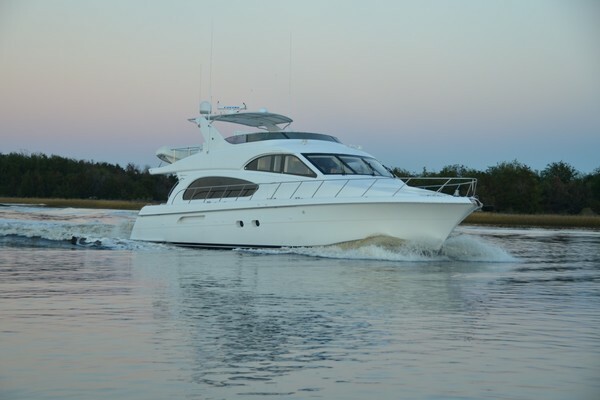 United Yacht Sales New Jersey would love to guide you through a personal showing of this 53' Hatteras Flybridge 53 Ed 1983. 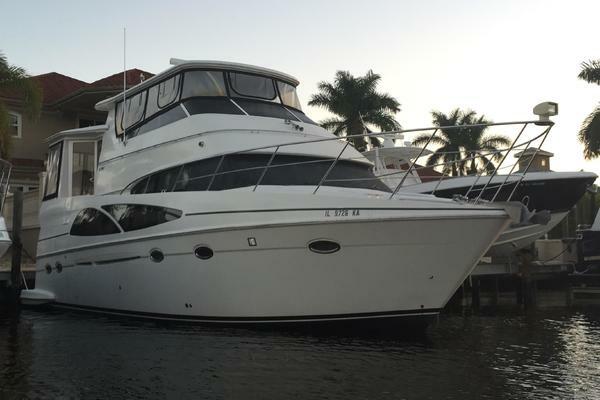 This yacht for sale is located in Fort Lauderdale, Florida and priced at $347,850. For a showing please contact us by filling out the form on this page and we will get back to you shortly!